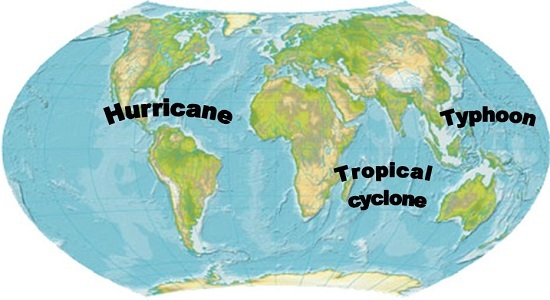 Cyclones, Hurricane and typhoon are storm systems that can produce extremely powerful winds, torrential rain, high waves and damaging storm surges, and can spawn tornadoes. These storm systems develop over large bodies of warm water and eventually may move over land. They are among the most devastating naturally occurring hazards and are capable of producing large-scale devastation on human populations. 1. Hurricane is tropical cyclone that affects the Atlantic and northeast Pacific ocean. Typhoon is a tropical cyclone that develops in the northwest Pacific ocean. 2. There are about 6 – 10 hurricanes per year. There are about 25 – 30 typhoons per year. 3. Occurrence of Hurricane is possibly between June to November month. Possibility of Typhoon is from May to October. What is a Hurricane ? A hurricane is a tropical cyclone in the North Atlantic Ocean, the Northeast Pacific Ocean, east of the dateline, or the South Pacific Ocean east of 160E. The Atlantic hurricane season lasts from June 1 to November 30, with the peak season from mid-August to late October. The Eastern Pacific hurricane season begins May 15 and ends November 30. What is a Typhoon or What causes a Typhoon ? A typhoon is a tropical cyclone in the Northwest Pacific Ocean west of the International Date Line with sustained winds of (or those that exceed) 74 mph. Typhoons can happen at any time of year, but the season typically runs from July 1 to September 30. Hurricane: North Atlantic Ocean the northeast Pacific Ocean east of the dateline, or the South Pacific east of 160E.